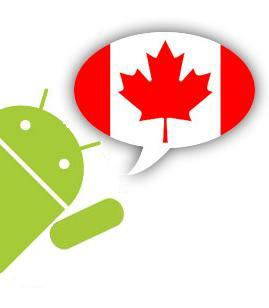 Android holds a large market share in Canada, if you are business owner in Canada and are yet to develop an android app for your business you are really missing out on something. Android is a full customizable OS and thus it has little limitations compared to other OS so you can get your application to do exactly what you want. An application can be anything that can prove to be useful for you customer or user this will help the user base increase gradually and thus more people will know about your business. To help you get a better idea of what kind of business application you should develop, I have mentioned below the latest top downloaded android apps in Canada. I hope it will help you gather a great app idea for your own business. Self Serve (2.72 Ratings, 250K+ Downloads): Self Serve is an account management app for Bell Mobility, Virgin Mobile Canada, PC Mobile and Solo Mobile clients. With Self Serve you can manage your mobile account anytime, anywhere – right on your mobile phone. View your account balance, track your usage, add features, and more. Bell TV Remote PVR (3.84 Ratings, 250K+ Downloads): Schedule and manage your Bell TV HD PVR anytime, anywhere from your Android Phone. With Bell Remote PVR you never have to miss your favorite show again. Also available for Virgin Mobile members. Cineplex Mobile (4.13 Ratings, 250K+ Downloads): Get movie showtimes, buy tickets, scene points balance; view latest news, trailors & interviews; get theatre maps, phone no. & admission fees; search by theater, movie, actor, news, photos and videos. Canada Post Corporation (3.14 Ratings, 50K+ Downloads): It can track a package, find a postal code, find a rate, find a post office, and do a lot more besides. CIBC Mobile Banking (3.55 Ratings, 250K+ Downloads): With CIBC Mobile Banking, you can complete everyday CIBC banking transactions like check balance, review transactions, pay bills, make transfers and find nearby CIBC branches on your device quickly, easily and safely. Transit Now Toronto for TTC (4.70 Ratings, 50K+ Downloads): Get all the Transit information of Toronto. Lot of customizations available like renaming your favorite stops, countdown timer, etc. GO Mobile (4.67 Ratings, 50K+ Downloads): GO Transit Official Mobile Application – This application enables GO Transit passengers to access and store scheduled information on trains and buses, receive information and notifications about their departures at Toronto Union Station, and browse proximate bus stops and stations on a map within the Greater Toronto Area. SAQ (4.07 Ratings, 50K+ Downloads): Get wine and food pairings, detailed product information, real-time product availability, favourites, current promotions, store locator, itinerary, barcode scanner. Scotiabank Mobile Banking (4.03 Ratings, 250K+ Downloads): Scotiabank® Mobile Banking puts your important, real-time banking details right in your hand. Check balances, pay bills, transfer funds and send money using your Android device. Next TTC (3.99 Ratings, 50K+ Downloads): Missed that TTC again? NextTTC uses the Toronto Transit Commission’s real time data to get you TTC arrival times. Now you can get the arrival times for all the buses and street cars. Take control of your schedule, never be frustrated with the TTC again. Reduce your SMS spending. A mobile app helps you keep your customers connected to your business. This constant connection will keep reminding them about your business and service and thus enhance brand recall and brand loyalty. If you have a similar idea to develop an android app for your business let us help you to make it a reality. Contact Us NOW! That’s very nice news and nice list of android apps too.